Pera Palace hotel was opened in 1895 to provide comfortable accommodations for the wealthy passengers of the Orient Express which departed in Paris and arrived in Istanbul. The hotel which overlooks the Golden Horn from the hills of Tepebasi in Pera on the Mesrutiyet Avenue was designed by a levantine French architect Alexandre Vallaury. Same architect is also known for his buildings of the Ottoman Bank on the Bankalar Street in Karakoy and the Archeological Museum in the Gulhane Park. 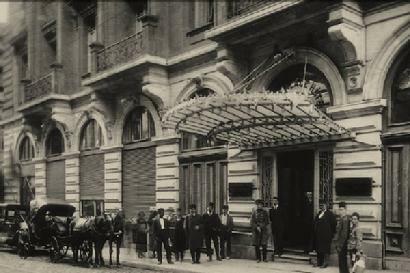 The rectangular neo-classical style building which is nine stories high, contains art-nouveau and oriental touches of the era.The passengers who were arriving at the Sirkeci train station were carried with palanquins to the horse carriage and then after travelling over the Galata Bridge and hills of Pera arrived at the hotel. Here once again they were carried with the palanquin to the elevator and without their feet touching the ground taken to their rooms.One of these palanquins is still displayed in the hotel lobby today.The glass cased elevator which is inside of an iron fence resembling a bird cage is also still in operation today.. The Pera Palace Hotel was the only hotel then with running water in their bathrooms, electric lightning instead of gas lamps and the first ever electrically operated elevator in the lobby.The first fashion show in Istanbul was also held here in 1926. The hotel which belonged to the French Railroad company of Wagonlit was bought in 1918 by a Greek businessman named Bodossakis for five million francs. Following the Independence War of Turkey and with the foundation of the new Turkish Republic Bodossakis moved to Athens and the ownership of the Hotel was taken over by the Turkish government. For a long time the hotel was run by a fondation but in 2006 the management rights of the hotel was bought by the Beşiktaş Shipping Group which started renovating the building. In 2010 the hotel was opened back to customers and in 2011 the management rights were bought by the Jumeirah Hotel chains. Pera Palace hotel had hosted several famous people in the past, among them were statesmen like : Ataturk, Churchill, King Edward VIII, Queen Elizabeth II, Austrian Emperor Franz Joseph, Jacqueline Kennedy, and also famous writers and actors like: Sarah Bernard, Ernest Hemingway, Agatha Christie, Pier Loti and ,Greta Garbo. It is said that Ernest Hemingway created Harry, the main character of Snows of Kilimanjaro here at the Oriental Bar,sipping on his glass of whiskey and inspired by his experience at this hotel. But without a doubt two of the most important guests of the hotel were Mustafa Kemal Ataturk and Agatha Christie. We will try to explain the connection of these two historic figures to the Pera Palace Hotel and also some of the mysterious objects in the rooms they had stayed. It is a known fact that the famous crime novels author Agatha Christie had written her famous thriller Murder on the Orient Express at the Pera Palace hotel in room number 411. What is less known however is where she had disappeared with her car in 1926. Her car was found ten days later after she disappeared, damaged and abandoned in the town of Harrogate, 200 km s from London. But nobody knew where she was and people speculated that she either had a serious illness, or a nervous breakdown or was meeting with a secret lover. Warner Brother started producing a movie in 1979 with Agatha Christie’s life as the main theme. To clarify her disappearance in 1926 they consulted a fortune teller in Los Angeles named Tamara Reed. The fortune teller told them that she was seeing on glass globe, Agatha Christie travelling on a train to Istanbul. Here in her compartment she was writing something on her diary, then locking the diary with a key and putting the key in her pocket. The next scene is at the Hotel at the Mesrutiyet Street where Agatha Christie is putting the key into a hidden box under the wooden floors in Room 411. Upon hearing this from the fortune teller Warner Brothers decided to investigate the truth of this information. After a long hassle with the hotel management they opened few of the wooden pieces on the floor by the door of room 411 and there they found a key about 8 cm long. But nobody knows whether this key belonged to Agatha Christie’s diary or not, and if it did, where was the diary. The room was recently renovated with burgundy colored curtains and furniture and can be rented for 400 Euros a night. During the British occupation of Istanbul after the First World War Mustafa Kemal’s house in Akaretler subdivision of Istanbul was under surveillance and he often stayed at the Pera Palace in room number 101. Even before when Mustafa Kemal was a young officer in the Ottoman army he had enjoyed his stay in this hotel after his trip to Germany with the heir to throne Sultan Vahdettin. Later as the first President of the Turkish Republic after the Independence war, and now called Ataturk (Father Turk), he often hosted his foreign guests in this hotel. Ataturk's room 101 is converted to a museum today and there is a rug in this room which holds a mystery. In 1929 an Indian maharajah had visited Ataturk and stayed at Pera Palace. As a token of his visit he had given Ataturk a prayer rug, who in turn donated the rug to the hotel to be displayed in room 101. Until Ataturk's death the only thing people noticed about the rug was how beautifully woven it was. But after Ataturk had died, all of a sudden the rug became the center of mystery. The gold plated clock on black background in the top section of the rug was showing 9:07 A.M., the exact time Ataturk's brain death. While the time showed 9 :07, the ring around the clock was decorated with 10 blue chrysanthemums. Chrysanthemums are called KASIM-PATI in Turkish and Kasim is the month of November. Since Ataturk died on November 10 , 1938 , did the Indian maharajah foresee the month, day and hour of Ataturk's death? We are not sure about this, but the rug is displayed in the museum room of 101 and visitors are still marvelling about its mystery. One of my projects I kept postponing for the last ten years was to visit the Pera Palace Hotel and to write my impressions about the hotel. About four years ago I had gone to the Tarlabasi district and stopped by the Pera Palace, not knowing the hotel was under renovation and closed to the public. Disappointed, I had walked back from Bankalar Street down to Karakoy. During my visit to Istanbul in 2012, I included the Pera Palace visit to my tour number 2 , which I had named the Pera tour. Initially the itinerary included the Pera Museum, the Arab Mosque, Mosque of Sokullu Mehmet Pasa, and the Mevlevi Tekke in Yuksek Kaldirim in addition to Pera Palace. Usually all of my tours in Istanbul to this point included two or three people at the most. But since the hotel was close to my Sankt Georg High School in Karakoy, my dear high school friends showed interest and the number of our tour participants increased to eight including myself. Since the number of tour participants was high and our time was limited we decided to shorten the tour : first to visit the Pera Museum, then visit Ataturk's room in Pera Palace and then have a 5 o’clock tea at Kubbeli Room of the hotel. It turned out that my high school's friends had also planned a surprise for me; following the tea we were going to the Melisa restaurant in Levent for dinner and a total of 26 people had signed up. In United States I had written to the hotel management and told them that we wanted to visit the hotel with a group of people, take some pictures and visit Ataturk’s museum room. I had received a positive answer from a lady named Irem from the hotels Human Resources. When we arrived at the hotel Irem Hanim greeted us at the door and took us to the second floor from the marble stairs next to the iron cage of the historic elevator to the room Ataturk had often stayed in. 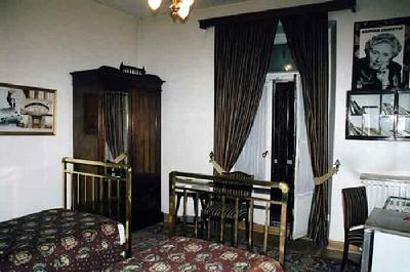 Ataturk’s hotel room was a suit consisting of two rooms connected to each other with an opening where the door was taken out. The first room was a study room with several arm chairs and canapes with three big portraits of Ataturk on the walls. There were few newspapers dated November 10,1938, the date Ataturk had died, laying on a coffee table and some of his personal belongings were displayed on a glassed table. Some of Ataturk's medals, books and magazines with pictures and stories about him were also shown off in a book case by the wall. But without a doubt the most interesting object in this room was the prayer rug woven on a gold plated black background decorated with blue stones, protected in a glassed case.The second room was like a master bedroom with a built in bathroom. The bedroom had a wardrobe with his personal belongings, a night stand with his pajamas and slippers and several pictures of his life line on the walls. In the middle of the room there was a bed with the head and leg boards built from ebony ,decorated with wood carvings and wicker and a white silk bedspread with matching pillows. After checking the room over for few minutes we went back to the hallway with red and orange color carpets to the marble stairs going down to the lobby. In front of the Kubbeli Room there were two green granite columns, resembling columns in Greek churches, and in front of each column two bronze sculptures of women, carrying wine jars on their shoulders were to be seen. The floors were all marble, decorated with pink squares. It is really difficult to describe the Kubbeli Oda or the domed rome in detail. On the ceiling there were six stain glass domes next to each other, a huge crystal chandelier hanging from the ceiling and a balcony- loft above, with wooden railings surrounding the room, decorated with wood carvings and vaulted windows covered with lattice. All of this reminded me of the Spanish palaces of Alhambra. Inside the room there was a grand piano next to a bar where they served alcoholic beverages, comfortable arm chairs next to coffee tables with marble tops formed into little private sections. While my friends were in the the Kubbeli Room, I checked the Patisserie de Pera and the Agatha Restaurant, the two beautiful eateries of the hotel. When I returned back to the Kubbeli Room I noticed that my high school friends who don't see each other often were in a heated discussion. I thought people in the room listening to the pianist and sipping from their drinks could be bothered by our loud voices . With this thought in mind we decided to look for a place on Istiklal Caddesi, the famous Rue de Pera, where we could freely talk and have fun. When we left the hotel I walked across the street and took one last photo of my seven high school friends in front of doors of the historic Pera Palace.